Sellics Home » Sellics Blog: Amazon Strategy Tips & Knowledge You Need to Succeed » Case Study: Does Keyword Repetition Improve Amazon Rankings? We do a lot of experiments to test assumptions and build new knowledge about how the Amazon ranking algorithm works. For each experiment, we create new products that are all exactly similar except for the one characteristic we want to test. We then analyze the search results to see if the difference in the one characteristic has an impact on ranking. With the following experiment, we wanted to find out if it helps to repeat keywords in your Amazon product listings, i.e. if a higher keyword density can improve your rankings. We tested whether repeated keyword placement and density across these areas can give you an advantage for your products’ rankings. We created several groups of products on Amazon for this experiment. Each group consisted of 4 products, and each group had a specific keyword. This keyword was then entered 1 to 4 times in the different keyword fields, all other things being equal about the products. So for example, the first product in a group contained the keyword only in the title, while the fourth product had the keyword in all fields (title, bullets, search terms, description). 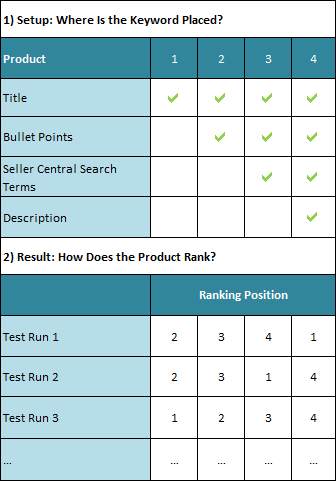 We then checked the rankings of the different products when entering the group’s keyword as a search query. The table shows the relative rankings of the products 1-4 for each group, and we can see that there is no systematic relationship between keyword density and the ranking for a product. Rankings didn’t seem to be affected in any way, so it seems that rankings are determined randomly for products that contain a given keyword and are otherwise identical. 1) Keyword repetition across multiple fields does not improve search result rankings. 2) Nevertheless, keyword repetition is not punished by Amazon’s algorithm. The key take-away here: since entering keywords repeatedly in different keyword fields does not improve a product’s ranking, you should not waste the limited space but rather try to find as many unique keywords as possible to make sure your product can be listed for as many search terms as possible. Put the most important keywords in the fields with the highest weight (title > bullets > search terms > description). Remember: While keyword repetition isn’t effective for Amazon’s search, it’s still important for SEO, so it can be useful to repeat the top keywords in the product description (avoid keyword stuffing of course!). The description is not as influential as other fields on Amazon and the space is not as limited as for the more important keyword fields. Need some (free) help with Amazon keywords? Sellics has a free Amazon keyword tool called Sonar which lets you search for related keywords, reverse look-up by ASIN and more. Check out the free Amazon keyword tool here – and use these keywords for listing optimization, PPC campaigns, product research, and more!